A cabin means different things to different people. For some, it’s a rustic retreat that’s just a small step up from tent camping. For others, it’s a luxurious escape that puts your own house to shame and just happens to be in the woods. 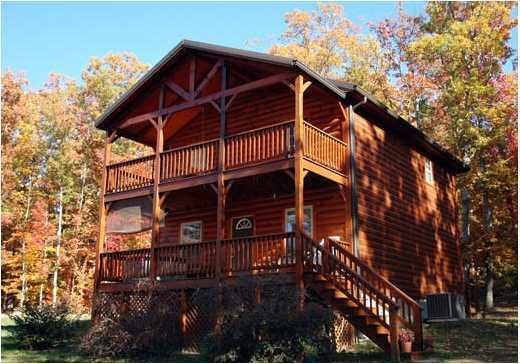 Whether you’re looking for a cheap place to sleep, a romantic getaway, or a gigantic lodge for that family reunion, Chattanooga has plenty of cabins or vacation rentals for you to choose from. Of course, the reason most people love cabins is because they offer easy access to the outdoors. Just hop outside and you can take advantage of all the wild adventures that Chattanooga has to offer. Here are five local cabins along with nearby outdoor excursions that will make for a memorable weekend trip. 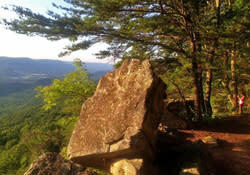 Lookout Mountain rises above Chattanooga like a sleeping giant, with two rock outcroppings—Point Park and Sunset Rock—that serve as perfect destinations for viewing the local landscape. It’s one of the most popular destinations in the area, with a great combination of scenic views and trails for all level of ability. In fact, these 6 Hikes on Lookout Mountain offer something that appeals to just about any hiker. For accommodations, it’s tough to beat the Cottages in the Clouds, which are located on a wooded site atop Lookout Mountain. The property includes one residential cottage and four vacation rental cottages. One has four bedrooms and two full baths, while the others have three bedrooms and two full baths. All have plenty of amenities to make you feel at home, plus great access to all the activities of Lookout Mountain. Also on Lookout Mountain, the Scenic View Log Cabins feature 12 homes—one or two bedrooms— that were built onsite by the owner using logs and stones from the property. The cabins offer spectacular vistas of the valley and Sand Mountain in the distance. Each of the cabins is unique with plenty of modern amenities, and you’re only about 30 minutes from downtown Chattanooga. For those interested in trail running, Lookout Mountain has some of the best options in the southeast. The Big Daddy Loop on the Bluff Trail is one of the most popular in the area, although it’s just one of many on the mountain. Battlefield Station is a turn of the century chinking log cabin with an oak and pine interior nestled on the the Tennessee side of Lookout Mountain. This quaint cabin is just minutes from downtown Chattanooga and within walking distance of the Lookout Mountain trails system. The property abuts the Chickamauga & Chattanooga National Military Park where the "Battle Above the Clouds" took place during the American Civil War, which is perfect for the history buff in your family. Located in the foothills of the Smoky Mountains, the Welcome Valley Village offers five log cabins located along the Ocoee River just two miles from the Cherokee National Forest and 45 minutes from downtown Chattanooga. The secluded cabins combine a rustic design with beautiful and luxurious amenities like stone fireplaces, gourmet kitchens, and hot tubs. A nearby riverside dock is perfect for fishing and paddling. The Cherokee National Forest offers just about anything an outdoor enthusiast could want, including whitewater rafting, fishing, hiking, tubing, horseback riding, and mountain biking. The Chilhowee Recreation Area is one of the few areas that offers singletrack mountain biking in the national forest. The challenging trails have made it one of the top destinations for off-road riders in the area. 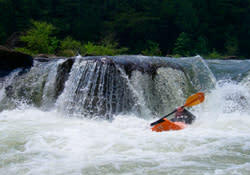 The Ocoee River is one of the most popular rivers for whitewater paddling in the world, attracting hundreds of thousands of kayakers and rafters every year. This popularity is well-deserved, as it has about 10 miles of excellent class III-IV whitewater, as well as a positive relationship with TVA that keeps the water flowing for weekend warriors all summer long. Adventures Unlimited, one of the outfitters that lead whitewater-rafting trips on the river, also offers lodging in their log cabins located on their 32-acre base camp. Located 35 minutes from Chattanooga, the large cabins are secluded from the other camping spots on the property and feature a full kitchen, 3 bedrooms and wide porch, a perfect gathering place. 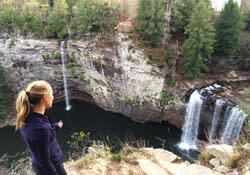 Just an hour from Chattanooga sits 20,000 acres of pristine wilderness. Fall Creek Falls, which has been called the best state park in the southeast by Southern Living Magazine, features towering waterfalls, cascades, rhododendron tunnels, streams, deep gorges, and virgin hardwood forests of oak, hickory, hemlock, and poplar. The 256-foot Fall Creek Falls—the tallest waterfall east of the Rockies—is spectacular, but is just one of four major waterfalls in the park. You can tour three of them in a moderate two-mile hike that includes breathtaking overlooks of the gorge and a swinging bridge your kids will love. Located just minutes from the park are the Cozy Cabins and Cottages, which offer affordable, small cabins that sleep four and feature a front porch and excellent outdoor amenities. The cabins are an excellent base camp for all to do around Fall Creek falls, including hiking, biking, swimming, golfing—and even trying out the zip-line course in the park.